On 3 August 2018, the Big Bad Fox and Other Tales is released from StudioCanal. This is the directorial debut from Patrick Imbert which screened at the London Film Festival 2017. This trio of tales introduces us to a set of atypical farmyard animals whose personalities and actions remind you of people you may meet in your day-to-day life. The works of Patrick Imbert (P.I.) will be familiar to many readers of Animation for Adult;. Patrick was the animation director on both Ernest & Celestine and April and the Extraordinary World. I was lucky enough to meet up and interview Patrick Imbert during the 2017 London Film Festival before the first public screening of the film. AFA: What attracted you to work in the field of animation and animated films? P.I. -- Well, it is a bit silly. I was studying as a designing or drawing. If I studied animation the course was shorter, it was less expensive and I could get a job at the end of it. P.I. -- Actually my dream at that time was to be a romantic painter like in the 19th century, but it was not possible so I did my studies in animation and I didn't regret it. And because the life in animation is cool so I didn't quit this medium, this world. AFA: Is there a difference between the attitudes to animation in France compared to say Britain or America? P.I. -- Yes, I will answer in French because this could be long. Sorry. I think that the industry in France is a little bit less "formatted" maybe. This has its advantages and drawbacks. In the United States you can do big films that make a lot of money, but then you kind of lose the kind of individual personality of the author or film. However, in France and Europe, there are lots of "auteur" films and the fact that the auteur/author is respected, hence more personal films. Often some of these films can be really bad and have lots of faults. This is important and interesting as they can be a bit haphazard in a way and that makes them all the more richer. I have the impression that they can be more varied and interesting in a way. And certainly the ones that made it to Britain you can see there is a variety of topics and a variety of styles and everything is much more rich as a result. P.I. -- So you agree with me then? Yes. We were saying before you came down that I skew more to French and European animation and Japanese rather than American. P.I. -- Actually, well American animation has had different periods. I think that Walt Disney Studio had their golden age many years later, and it's not any more ... but there are good things everywhere but not everything. You have to pick the good things and this is what we do with Benjamin. We like both some of the good Japanese movies and also some good American movies. We try to select what is good in each and to gather it in our own movies. AFA: What has influenced your style of animation and design? P.I. -- Hmmmm, well, erm ... Regarding the Big Bad Fox, this is Benjamin's style (At this point we started to flick through the book I had brought with me) but I think he has been influenced by the work we did all together on Ernest & Celestine which is a very sketchy way to draw. That is correct? And regarding the animation as I told you it's both ... we took the good ideas from the Japanese way and American way. The way we wanted to animate the movement of the characters it is as if we were looking for actors, so the characters become actors. Then the style has to be at the service of what we want to say. Even if that is just a joke, everything has to work towards that aim. We're not making things move just for the pleasure of it. Everything is ... dosed ... measured. Does that answer the question? P.I. -- Of course when we were kids we saw all this anime on television and it ... feeds you. In the quality ones there are the Ghibli films of course. Of the Ghibli's my favourite are the Takahata movies (I got quite happy here). He has this sensibility and he is I think a director, not just an animation director but a director. He does cinema and he uses animation as a tool but he is a real director in my mind, and this is what I like in his work. This is maybe one of the biggest influences. But when you do such work there are many influences. Both Benjamin and I like slapstick cinema, the old cinema of Charlie Chaplin and Buster Keaton and we really use this as a comedy reference because this film is a comedy. So it is a mix on many things. The style, the colours, the lines it just reminded me of it. I love that film so I was very happy. P.I. 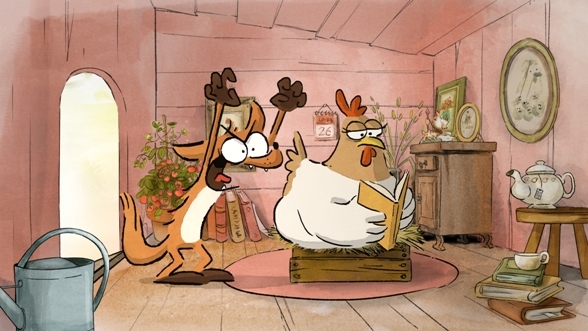 -- You know at the time we did Ernest & Celestine, I'm talking about this movie because the Big Bad Fox is based on the techniques we finessed on Ernest & Celestine. When we did Ernest we really watched the Yamadas and we were wondering if they can do drawings that are not ... the lines are not finished ... it's possible so we will try and do this. And watching that one (the Yamadas) and this one it felt like a watercolour was being animated in front of me and I got the same feeling with the other ones. It's a style I love, and I'm not just saying that, I genuinely love watching that kind of sketchy, water colour-y ... it's not perfect but it looks spot on. P.I. -- Exactly, it's not perfect. We tried to keep the look of the drawing, the watercolour drawings (from Who's Afraid of the Big Bad Fox) and My Neighbours the Yamadas. We saw the Yamadas so we thought o.k. it's possible now let's try to do it in our way but let's try to do it. 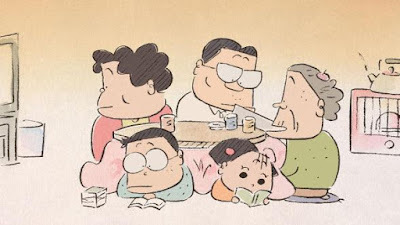 Hopefully, they did it before and it was kind of a challenge, he (Takahata) opened the way. It was possible because they had done it. Yeah, I think it cost them quite a lot to do it as well but it's worth it. I think. P.I. -- For us it was not very expensive (brings much laughter). We are quite proud of the fact that the public don't care about how much things cost. We've done something well. Ernest & Celestine was quite expensive but this, the Fox, is cheap. Really. (Again, much laughter) We gathered the team from Ernest & Celestine and just said "let's do it again". Everybody knew what they had to do so it worked well, it went really smoothly. It is a very craft based or artisan technique. AFA: Is it all done in a computer or is it paintings that are scanned ...? P.I. -- The characters are all done on computer. Absolutely all, but done with the graphic tablet. I mean we call it ... digital 2D, but we are all drawers or draftsmen/people. We did studies in classic art. So it's ... everything is drawn frame by frame, there is no computer help. The computer helps for animation because it is convenient. You press enter and you see the animation. And regarding the backgrounds they are ... it's a mix of watercolour textures and sketches in Photoshop. This is the same couple of background artists that worked on Ernest & Celestine before. 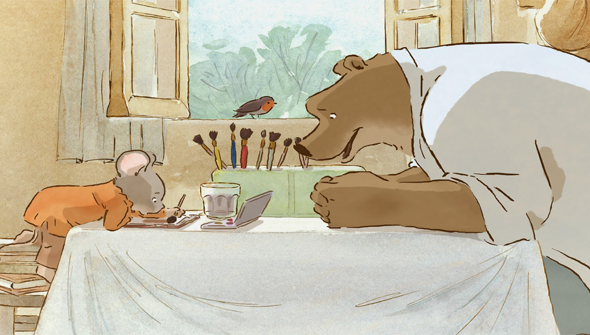 On Ernest & Celestine they have scanned a lot of their own watercolours and they have reused them. So that's why it's cheaper because they had it on their hard-drives and they could re-use many things. If you look at the (Big Bad Fox) movie, when you get the DVD, sometimes in the backgrounds the trees, shapes and silhouettes, you can see they are the same as in Ernest & Celestine. It's a game you can play. 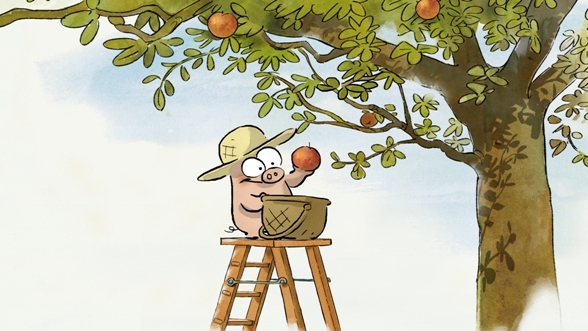 AFA: Having worked on Ernest & Celestine and this, what are the challenges of taking an established book and translating it to film? P.I. -- Well, it's not the same medium so the language you have in the book either with drawing or just words is not the language you have in a movie. Suppose in a book you can take the time you want to read. If you want to go faster you can turn the pages faster. If you want to go back you can. You do what you want. In a movie you ... impose the rhythm and the speed for the viewer. So you must not be too fast or slow and everything is different. You see there is a lot of text or dialogue in the book and it was absolutely impossible to put so much dialogue in the movie. Benjamin just writes as he speaks which for a movie doesn't work, so we had to cut a lot of dialogue and then you have to be more visual. If you do just dialogue it's boring. Also, the actors who have recorded the voices they did not know what to do with all this dialogue [much laughter from all). So ... it's another language. I have friends who have read Ernest & Celestine who have seen the film. For them it was a different experience as they had one view and they saw something else, it was not quite what they expected, they were different things. P.I. -- You know the Fox movie is adapted from this (a copy of the book was on the table) and it is quite the same story. Erneste & Celestine was an original scenario, it was not taken from the books. The books are short stories and on the movie we had the novelist Daniel Pennac, a famous novelist in France. He wrote the scenario different from the books but with a state of mind close to the books. So it is not the same adaptation matters. AFA: How did you and Benjamin start working together? P.I. -- It was on the pilot of Erneste & Celestine. That time he was I think animation supervisor or artistic director. I was an animator and the director of the pilot did not get on well with the producer so he left. So for the final production, Benjamin became director and I became the animation director and we got on really well. AFA: Was it a pancake recipe? P.I. -- That's it. It was for the pleasure of the joke. P.I. -- It was a reward for those that stay to the end. ... as well as the tap dancing frog. AFA: A friend of mine suggested this question and I really liked it. What advice would you give to your teenage self? P.I. -- Ooof! Don't worry, it will all work out for the best. I'd like to say a big thank you to Jessica Brown from StudioCanal for arranging the interview and of course to Patrick Imbert who graciously took time from his busy schedule for the interview. The Big Bad Fox and Other Tales will be released on 3 August 2018 and the AFA review can be found here.